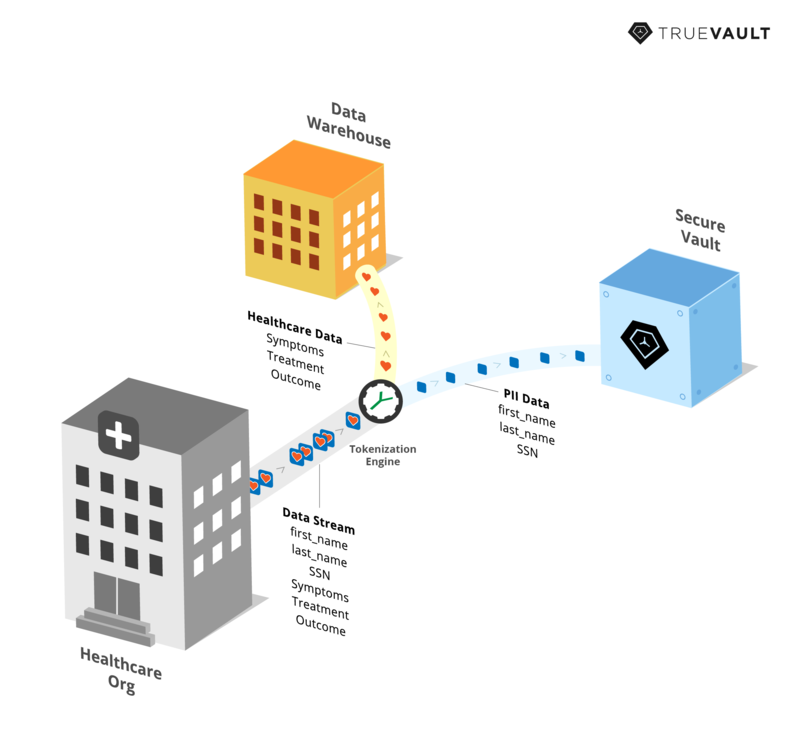 Today, TrueVault is launching Tokenization Engine, a new feature of SecureVault, to help companies import healthcare data without the legal burden of HIPAA compliance. There is clear business value to leveraging health behavior data, but working with healthcare data can be problematic. If a company wishes to work with healthcare data, chances are this data includes Protected Health Information (PHI), a special class of data that requires compliance with HIPAA regulations because it includes patient identity details. Healthcare data that includes patient identity requires extra security measures under HIPAA, and places a legal burden on the company. The company has two choices. Build and maintain its own HIPAA compliant infrastructure, a costly endeavor that involves legal burden. Or turn down opportunities that involve PHI, feeling it not worth the risk or financial investment necessary to comply with HIPAA. Tokenization Engine is an add-on to our flagship product, SecureVault. It works in three simple steps. First, it acquires data that includes PHI. Next, it tokenizes the data. This means separating the identity data and storing it in SecureVault, or removing it entirely. Finally, it passes the de-identified data to any data warehouse, regardless of whether or not the data warehouse is HIPAA compliant. Once de-identified, this data is no longer subject to HIPAA and can be used by companies that are not already HIPAA compliant. TrueVault assumes all liability for data stored in SecureVault, so companies can import healthcare data for lifesaving and life-changing purposes. Artificial intelligence (AI) companies need data to train their machine learning models. And if the company wants to work in healthcare, the data they’re acquiring will include PHI. This creates a challenge for AI companies that are not already HIPAA compliant. Tokenization Engine makes it possible for AI companies to work with healthcare data without worrying about HIPAA compliance. Tokenization Engine will decouple identity data from health behavior data, only passing the de-identified behavior data to an import process. Tokenization Engine allows AI companies to acquire the data they need to train their models, without taking on the burden and the liability that comes with PHI. More importantly, Tokenization Engine allows more AI companies to enter the healthcare space by giving them access to the behavior data they need to engineer breakthroughs in machine learning for health.